Business processes hosted in a BPM container (whether running in-process or as an external engine) need to be exposed to consumers in your enterprise. 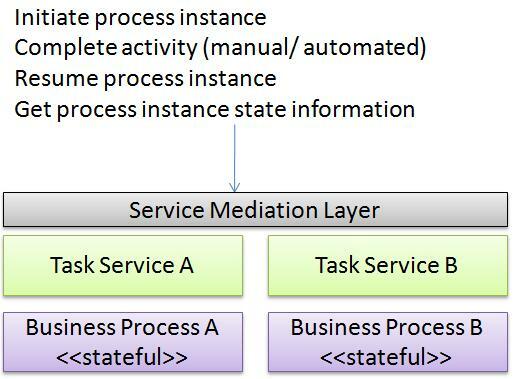 Here’s where your SOA efforts can come in handy – these business processes can be exposed as services via interfaces provided in the service mediation layer. Doing so decouples the vendor specific business process interfaces from enterprise consumers and allows for additional horizontal capabilities to be hooked in (metrics capture, monitoring, authentication, authorization etc.). These services are commonly referred to as Task Services and they encapsulate operations on business processes. Common domain-relevant schemas can be leveraged from other services efforts – facilitating consistency and reduce data transformations between the business and services layers.